Keeping a balanced diet is essential for health. Our daily food intake, unfortunately, is often unbalanced. 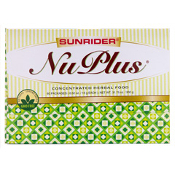 Sunrider's most basic herbal food is formulated with herbal ingredients that serve as a foundation on which to build a healthy diet and to fill in nutritional gaps. NuPlus® Concentrated Herbal Food blends herbal tradition and nutritional science. It's a balanced herbal formula based on the Chinese tradition of health maintenance through proper nutrition. Sunrider owner expertise integrates the Philosophy of Regeneration™ —to nourish (Yin) and cleanse (Yang) the body—with sound nutritional research. It's naturally low in calories, fat and cholesterol, and makes a smart choice to consume in between meals and at any time throughout the day. The all-natural, superior ingredients avoid chemical isolates, preservatives, added sweetener and fat.